I’m actually using a comp day today because I get some time off since I worked through the weekend while in San Diego last weekend, so my weekend is not quite over. And I’m so excited to be using today to head up to Philly to see my nephew Harper! I cannot wait to see him in his home for the first time, after 129 long days in the ICN. He’s almost 7 pounds now and looking so good and chubby… Plus, I get to hold him today!! So exciting. I promise to share some pics tomorrow. 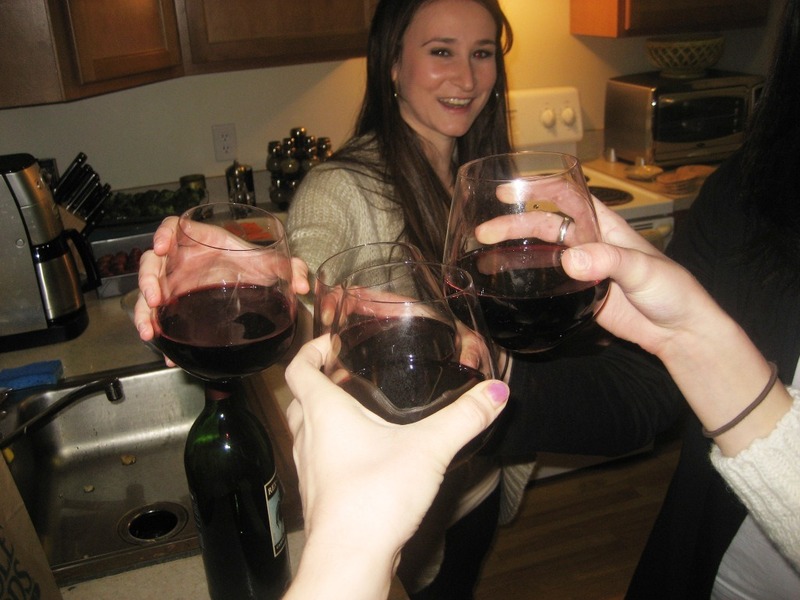 One of the most fun parts of this weekend for me was a dinner party on Saturday. My friend Rachel (who’s wedding I was in this past August) lives about 45 minutes outside of DC, so my girlfriends and I don’t get a chance to venture up there too much. When we got an invite from “The Real Housewife of Ellicott City” to come over for dinner, it was the perfect opportunity to head up there. 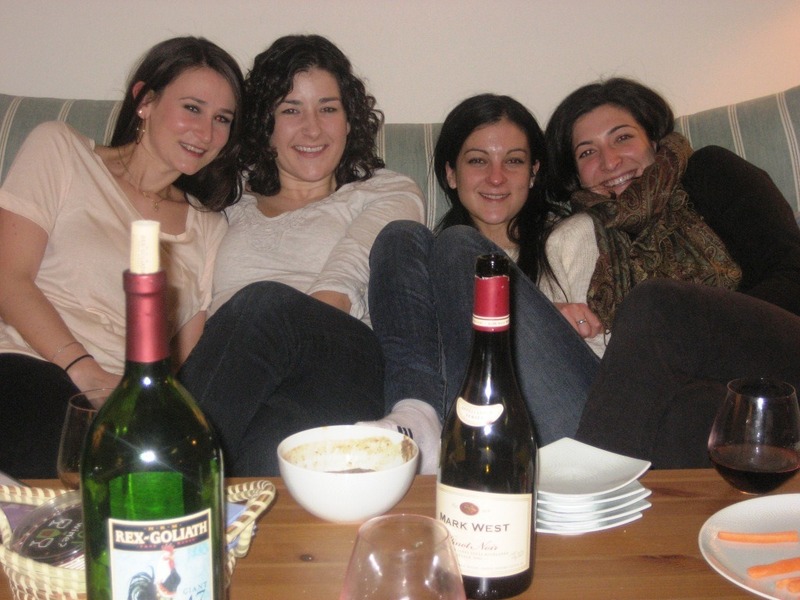 In college, we had a group of six of us that were best friends, and after we graduated four of us stayed in DC, one moved to NYC, and one moved home to Boston. I’m glad to be in the group of 4 that stayed because its so nice having my best friends so accessible. 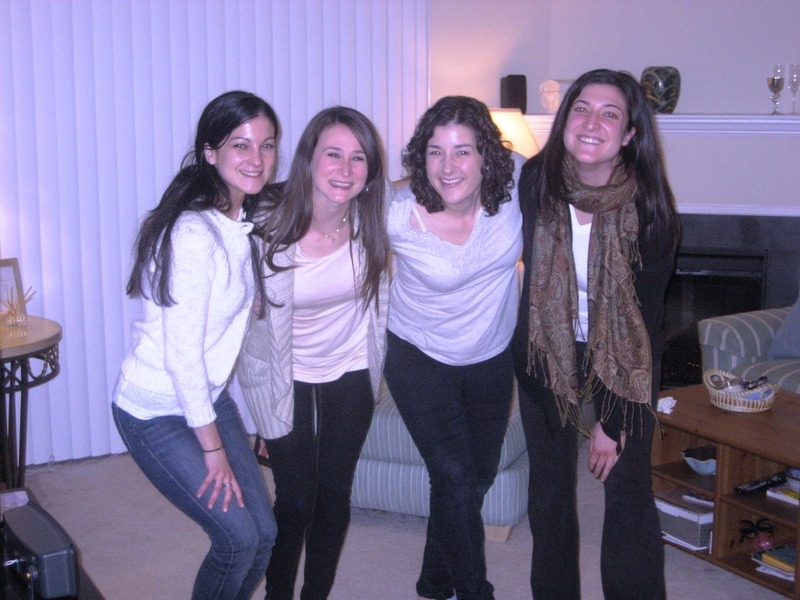 And, even though we all live so close, it had been way too long since the four of us had been together! Rachel set up the table so cute! 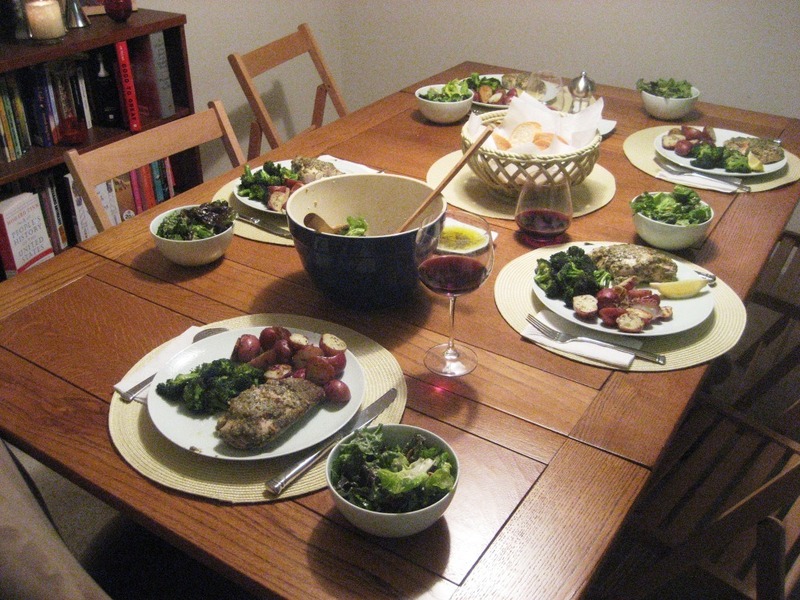 Then the table got more full once the salad was served too. 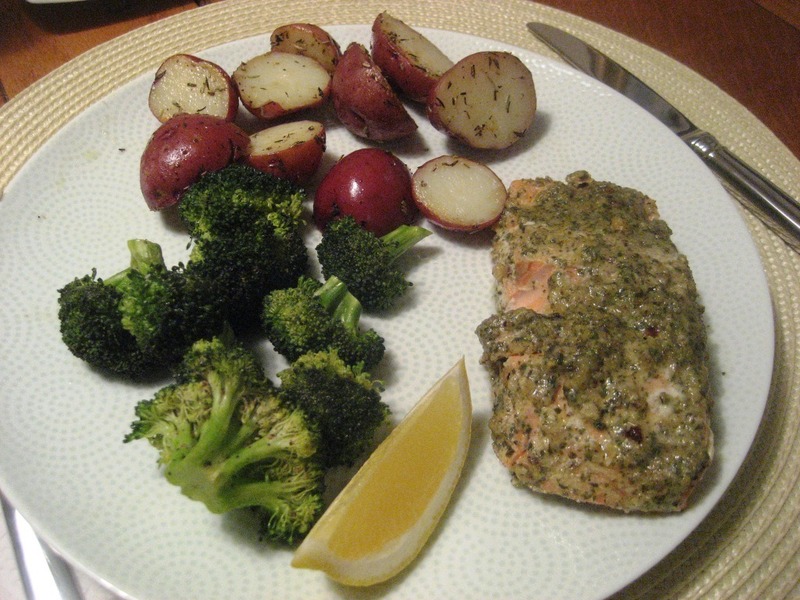 Roasted broccoli and red potatoes, plus salmon baked in foil with a walnut pesto sauce. The pesto was SO delicious – its so simple but somehow I always forget about it and how great it can be for all types of meat (or veggies). She used that same pesto to make chicken for everyone else (not everyone is a fish fan otherwise she would have made salmon for all), and it was totally delicious. As the night went on and the wine flowed freely, it got harder to have everyone on the same page about when to take a picture. But then we all decided to get in the same awkward pose in sync with each other, so I guess that works? 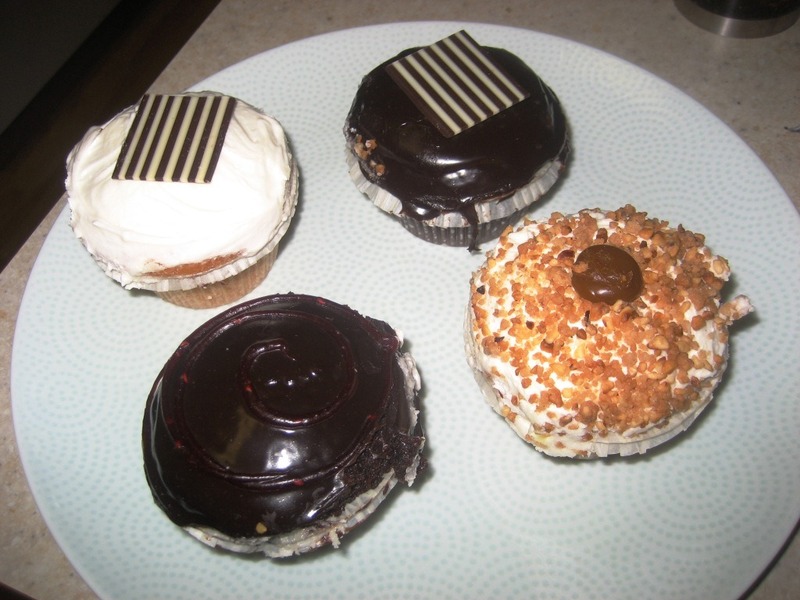 There was caramel something, chocolate raspberry, vanilla with buttercream frosting, and double chocolate. My job was to try to cut them into pieces, and I was pretty impressed with my work. Plus a huge pile of brownies that Rachel made. I ate way too much of this plate but it was delicious and totally worth it. Such a fun night! Where have you met most of your friends that you hang out with? College, high school, work, other ways? My best friends are mostly from college, but I’ve made some really close friends from work, too. 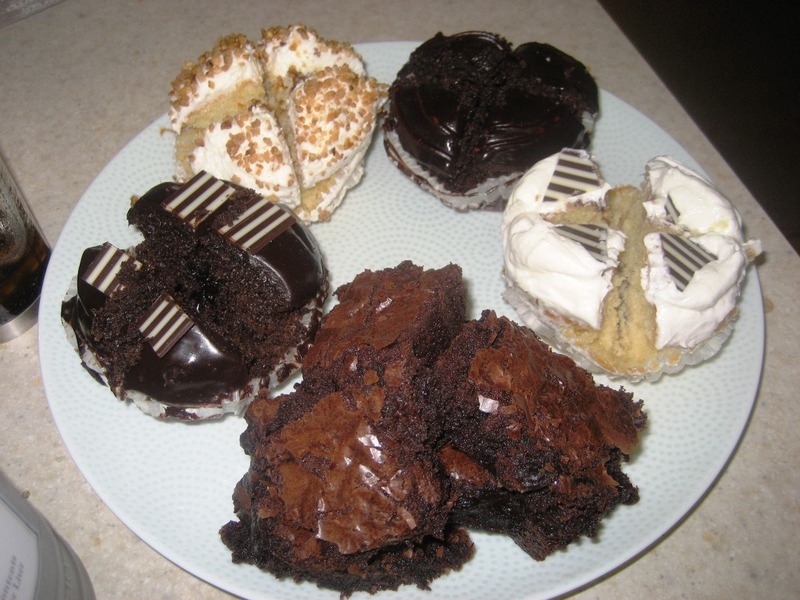 Oh man.. those brownies look like a little slice of heaven! 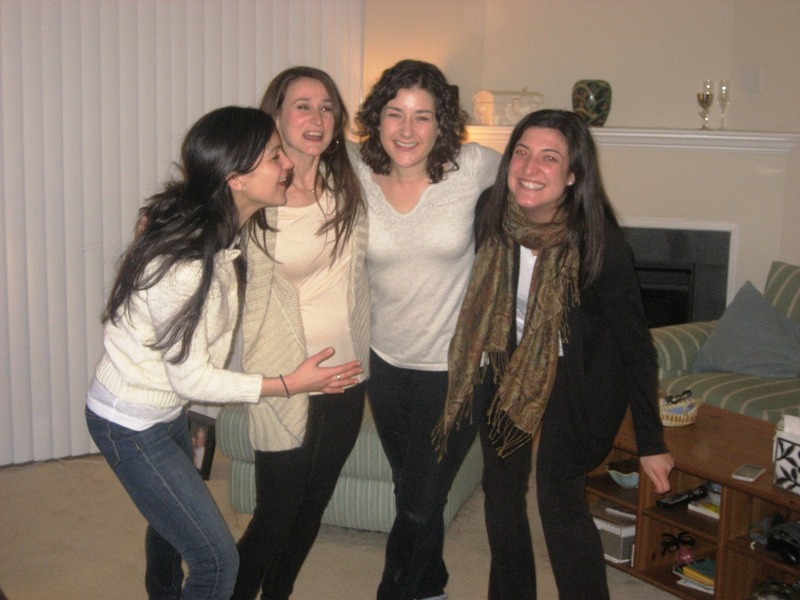 My closest friends I met in all different ways…one from grade school, one from work, one through a former friend, etc. It’s nice to live so close to your friends! I have a few friends from high school, a few friends from work and a friend from the neighborhood. Such a fun night! Love the random ones in. My current group in Chicago that I run around with most often includes 2 neighbors and a best friend from college. We all mesh really well- even if we’re all very very different people. Looks like you had an awesome night! You’re so lucky your college friends are so close. My best friends are from college, but unfortunately I don’t get to see them as often as I like. I met up with my college girls this weekend and we went out to a Karaoke bar. sooo fun! i’m jealous! Not nearly enough of my college bffs live in the area. We are spread all over the country. You’re lucky so many of them are so close! 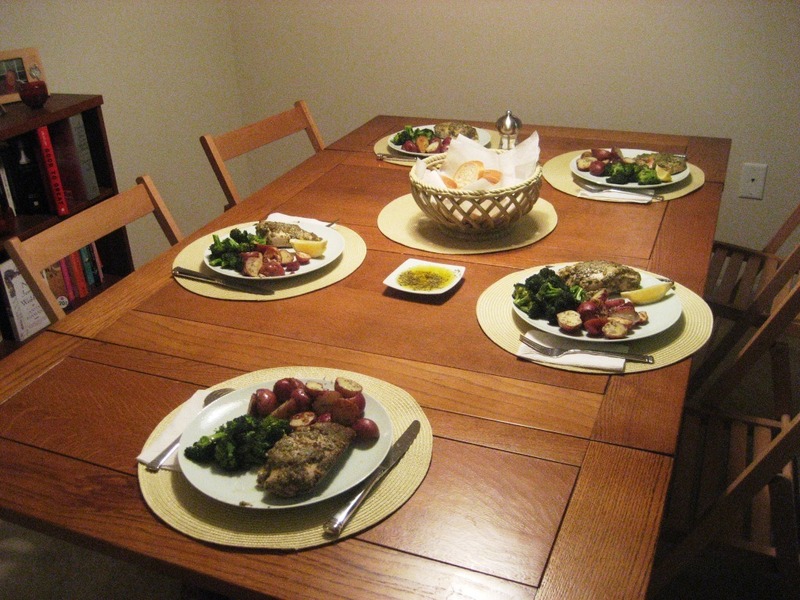 Looks like you had a wonderfully delicious evening. My best friends are from college, but I don’t get to see them much!! 🙁 I do have a lot of good friends from work too, but the college ones are the ones I am closest with. That salmon looks great! I never thought of doing pesto…. Aww, I love that candid shot!! Nights with friends are just the best…especially when they involve delicious desserts!! Yum! Fun night! The cupcakes look amazing! Yay, congrats on such a big day with getting to visit and hold Harper! So glad to hear that he is doing well! And what a great night with your friends! Makes me miss mine. Most of my close friends are from college and all are back in the Midwest, it is so lonely without them close by, but I am trying to be proactive and make new friends at this stage in my life. Most of my friends are from various workplaces. My best friend lived next door to my grandparents. We’ve been friends since I was 2. Her sister is another one of my bffs. I have a few friends from elementary school spread throughout various states. Several friends are wives/girlfriends of my husband’s friends. Oddly I don’t think I really talk to any of my college friends but I went local and didn’t stay on campus so I never really got that close to many people. Don’t forget you can make pesto with arugula (or really anything else). Basil can be hard to get in the winter, and arugula is a delicious stand in. I basically learned about virtually all of this, but never the less, I still assumed it turned out beneficial. Fine work! I have to say that I met my friends from college – I keep with them the most. And then lawschool. I think high school friends have drifted away and we see each other once in a while. For some reason the college and law school friends have stuck! P.S. Umm I need that salmon recipe!